The 2015 capture season authorized by the ESRD has begun as of February 13th. Our WHOAS Board members and volunteers were on pins and needles awaiting word of any wild horses captured. 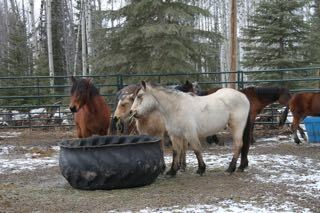 Monday evening we received word that some horses had been caught and that they were all young studs. As indicated before, WHOAS was given the opportunity to select all or any of these horses. The were hauled by the trapper to a location where we could select those that we are confident we could work with, gentle and find good adoptive homes for them. Rallying our group of volunteers on Tuesday morning we went to the pick-up location to view the horses. Five young males, 2 years old and younger, were identified as the best prospects. 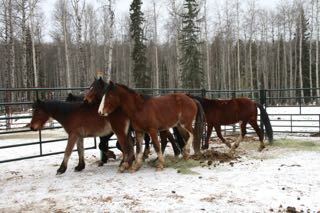 Without any difficulty they were loaded into our trailer and transported. 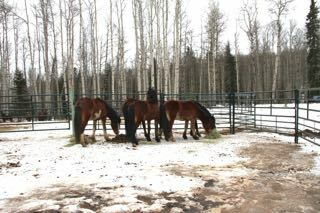 Our facility had been set up to enable us to unload any horses safely. 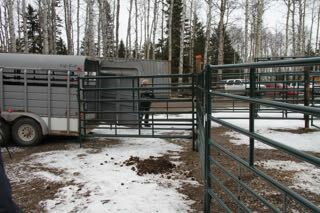 Opening the trailer gate, it was wonderful to see the boys dash off into their new pen. This will be their home for a period of time until we can gentle them properly, have them gelded and then rehomed to their new owners. They soon realized this place was okay with some fresh hay awaiting them. They all began to concentrate on having a few bites to eat and they quickly settled down in this new environment. We will wait a few days for them to become accustomed to us before we go any further in handling them. 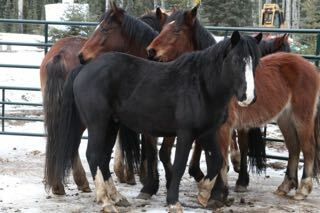 WHOAS will continue to respond and rescue if any more wild horses are captured. It is our intention to take in as many as we can adequately and safely handle. This for the horses’ safety as well. As we have indicated before we only have limited resources and volunteers able to help. Keep checking for updates. Thanks to those who continue to support us in our efforts. Great to read! 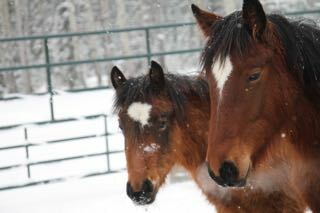 Thank you for the difference you are making for our wild horses. I can only imagine how much time, effort, and funds this all must take and all in the name of saving the horses! I hope you continue to get the recognition you deserve to keep this effort alive. Cheers. DITTO with Kim, posted on February 18th, 2015! !